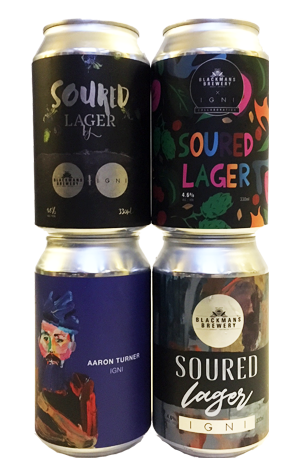 For this lager, Blackman's worked with Geelong restaurant IGNI. But the collaboration didn't end there. No, they decided to get some local artists involved too, bringing in four of them to design labels for the beer. So, before we get to the inside of the can, a quick tip of the hat to (from top left clockwise) Hadyn of Torquay's We Are Purpose, Nick Mills, Casey Burill and Mel Macilwain. As for what's inside, it brings together two of the Blackman's brewers' favourite things: lager and sour beer. Or maybe three, as there's a hint of pink there too as with a couple of previous sours – this time obtained from the addition of Davidson's plums and native pepper. Aroma wise, you might pick up some berry/gooseberry as well as almond and (if you're a Brit) Parma Violet lollies (but you'd call them sweets, not lollies). There's a bit of pale malt sweetness and a touch of tang on the palate too, but with everything delivered in small doses.